This recipe is a simple and healthy one that is promoted by The Heart and Stroke Foundation. It may not be the strictest slow carb recipe that I have, but it's simple, tastes good, and is good for you. I'm sure that it could find a place in anyone's slow carb diet repertoire. 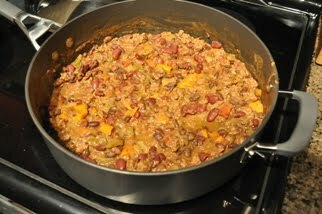 If nothing else, it at least is a change of pace from the usual beans and lentils recipes. You know what I mean. ;) A 3/4 cup serving of this recipe only has 107 calories, 8 g of protein, 6 g total fat, and 8 g of carbs (4 g are fiber). Cook the edamame for 4 minutes in boiling water. Drain and rinse the edamame in cold water, then transfer them to a large bowl. Add the shredded carrots and coriander/parsley. In a separate bowl, combine the remaining ingredients to make the dressing. Whisk well to mix. Add the dressing to the beans and carrots, and mix well to coat everything. Though not absolutely required, I enjoy this dish best when it's cold, so I cover and refrigerate for a while if I have time. This makes a great appetizer for a nice summer meal or barbecue.